When Meredith at Significant Events of Texas called to tell me she had the perfect couple for me, little did I know I would be meeting one of my favorite couples of 2012. Erica and Taslow are Oklahoma State alumni who are both die hard Cowboys (OSU that is) and wanted to party with their closest family and friends. The McKinney Cotton Mill was basically a destination wedding for the family and friends. We worked together to create a starting line up introduction that was personal and reflected the sports nuts who got married. Marc Roberts was kind enough to put together this little highlight video for me. Shawn and Chris were married at Marty Leonard Chapel and then took a short drive over to Joe T Garcias Restaurant for the reception and celebration. Chris is a wedding videographer and Shawn is a wedding photographer, and seeing as they know a lot of Fort Worth Wedding DJs it was even more of an honor to be asked to be their DJ & MC. The weather was perfect – warm enough to be outside sipping a margarita but cool enough to really go crazy on the dance floor. Special thanks to When It Clicks Wedding Films for allowing me to share this video. I will get photos from Lauren Ashley up in the next couple of days. 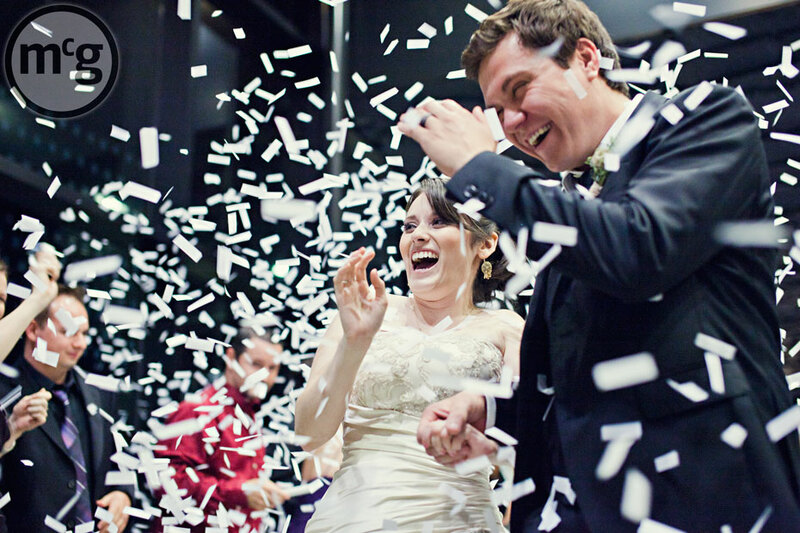 Chris + Shawn // the highlights from WhenItClicks Wedding Films on Vimeo. Kirsten and Ryan celebrated their ceremony and reception at the beautiful Fort Worth City Club. My team and I had the privilege of working with an all star team of vendors. Tami Winn and her planning team and floral team made the room beautiful and the night flow so smoothly. Tracy Autem and her photography team were having fun while capturing the memories for Mr. & Mrs. Hood. Last but not least, Daniel Troupe with Lynn Films was capturing the video to document all of the fun that was being had throughout the City Club. Special thanks to Daniel for sharing this preview video. I cannot wait to do a follow up post with Tracy’s photos and the extended cut of Daniel’s film. A few weeks ago we shared the video from Colleen & Byron’s incredible introductions where the wedding party pulled off a choreographed dance to kick off the night. Their wedding highlight video is ready to be shared and show off how much fun we had celebrating. Special thanks to Mark Owen for sharing the video. Shout out to Holly Tripp Event Design for putting together this amazing team of vendors and for making my life easier. If you like the flowers, which why wouldn’t you, check out The Wildflower. I will post Sil Azevedo’s photos this week! 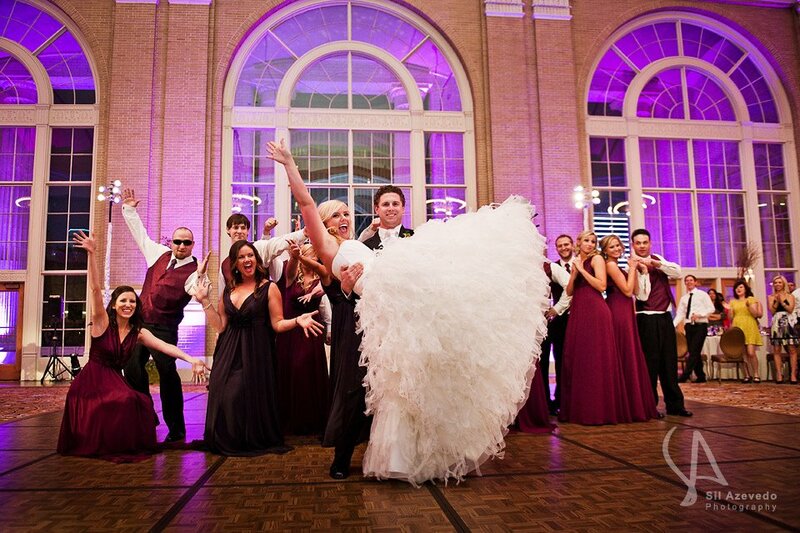 Colleen & Byron celebrated their wedding and reception at the beautiful Union Station in Downtown Dallas. Colleen and her bridesmaids have been dancing together for years on the high school dance team and in the living room, so when it came time for Colleen and Byron to tie the knot the girls saw this as an opportunity to choreograph an epic introduction dance. This is the result of all of their hard work! Special thanks to Sil Azevedo Photography for the photo, Holly Tripp for all of her hard work on the planning and design, and The Wildflower for floral and decor. 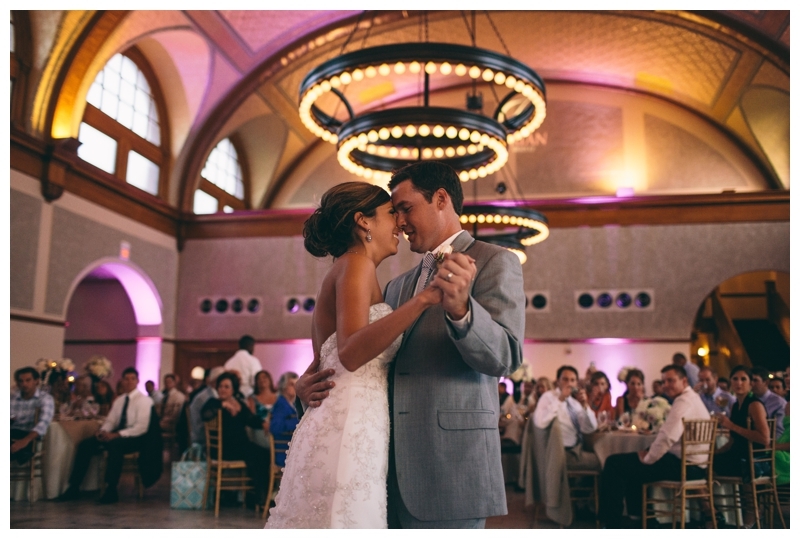 Jadrien & McCall celebrated their TCU wedding in style at the Fort Worth City Club. I posted a video of the dancing that we shot from behind the booth a few months back. Having just graduated from TCU a few weeks before the wedding, our 18 member wedding party was full of Horned Frogs. We provided the purple uplighting. TCU was kind enough to allow Super Frog to pay us a visit and allow for a photo opportunity. Turquoise Video Productions was kind enough to share this beautiful highlight of their ceremony and reception. Jadrien + McCall Grimes wedding highlight from Turquoise Video Productions on Vimeo. I had the privilege of working with the Wish Upon A Wedding Foundation. Wish Upon a Wedding is a nonprofit organization that provides weddings and vow renewals to couples facing terminal illness and serious life altering circumstances, regardless of sexual orientation. Tiffany and Mark had only been dating about 4 months when she became very ill and was diagnosed with islet cell hyperplasia. Over the past two years, Tiffany and Mark (and their combined 6 children) have had to go through a lot, but as you can see from the wonderful film Dulock Productions shared below the family is stronger and happy to have each moment together. 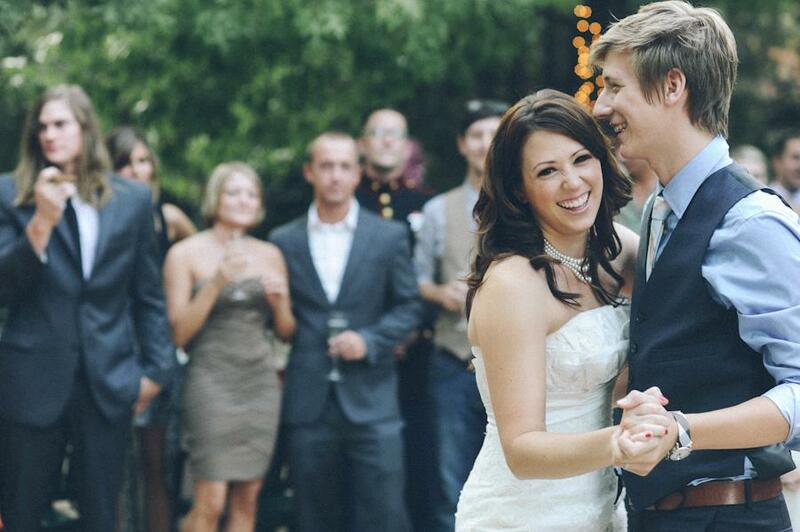 To learn more about Tiffany & Mark’s story, check out their love story. Mark and Tiffany – Highlight from Dulock Productions on Vimeo. Thanks to Dallas Wedding Videographer Daniel at Lynn Films for sharing the highlight trailer he shot on August 13th of Jenny & Jeremiah’s wedding reception at the McKinney Flour Mill. We got the pleasure of working with planners Meaghan & Kelly at Sweet Pea Events to create one memorable evening. Jeremiah + Jennifer from Lynn Films on Vimeo. Uplighting and Dallas Wedding DJ Services provided by Glenn Roush.